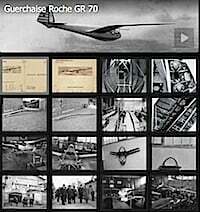 Louis Guerchais first learnt his glider building skills when he worked as an engineer for Farman in 1919. 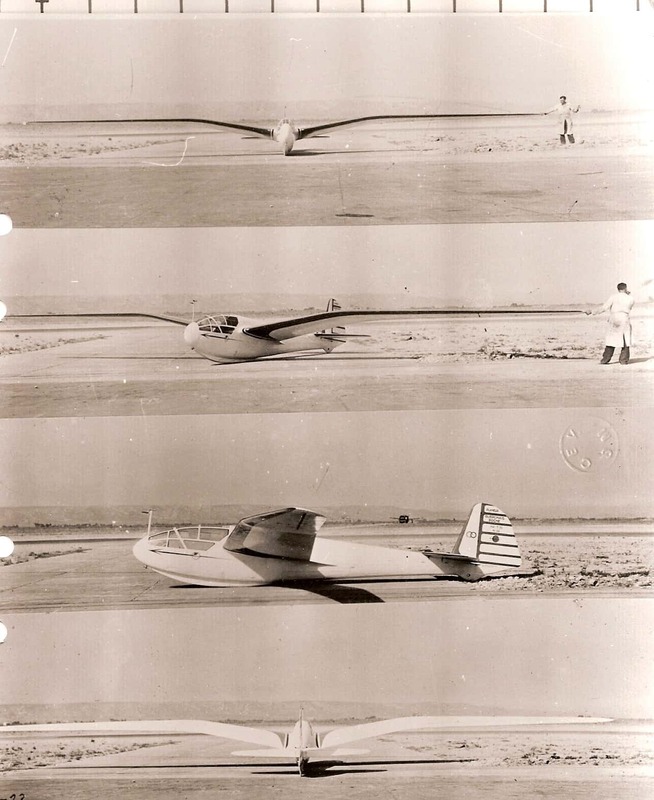 In 1922 he produced his first own designed glider (shown below) which took part in a glider meeting held at Combegrasse, south west of Clermont-Ferrand in France and was piloted by Coupet. He later went on to design the single seat G.R. 70 in 1938 as well as the side by side 2 seat G.R. 105 and the single seat G.R.107. 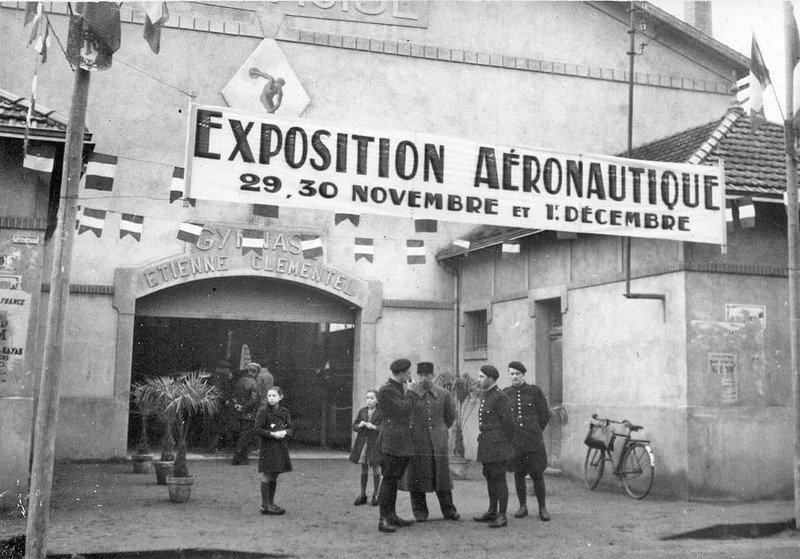 French gliding had completely stopped during wartime hostilities, but efforts were made during 1941 to restart gliding in the “Free Zone”. Guerchais produced two prototypes of the G.R. 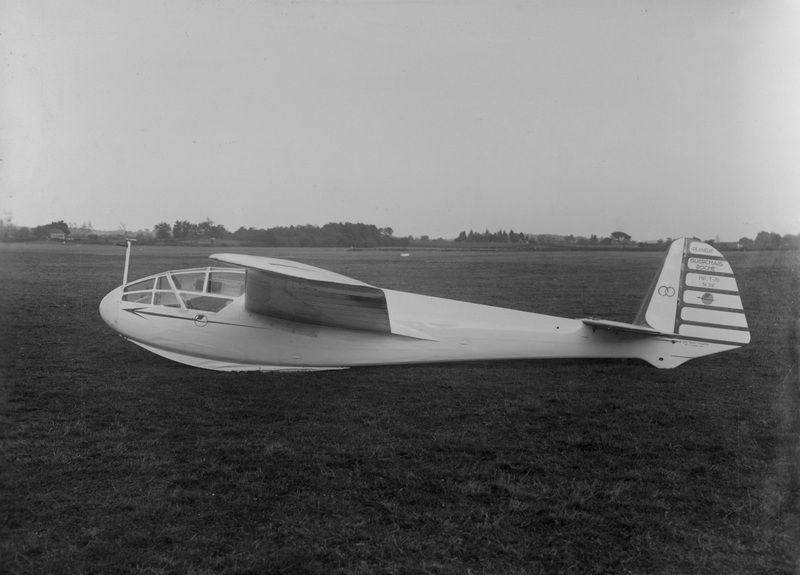 70, a Gull Winged 17 meter glider described as a French mini Reiher and were finished and flown during 1941 and ’42. The GR70 was equipped with a hook for winch launching and towed flight. 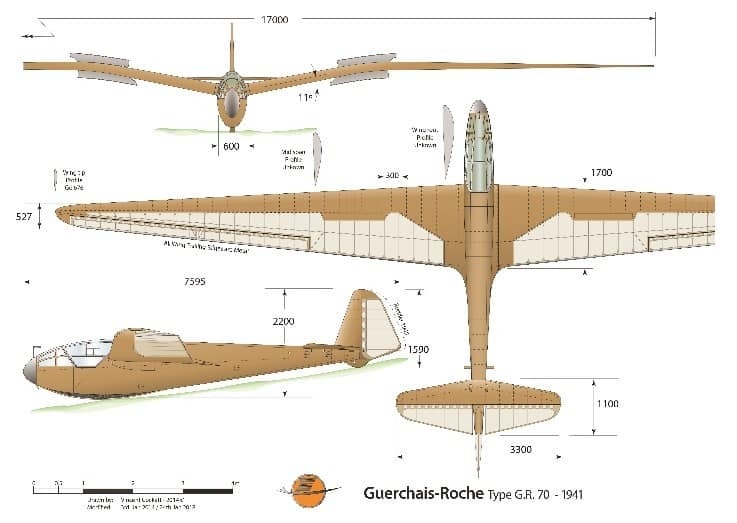 Before the war, France had been very much behind Germany supremacy in gliding, however, along with the two seater G.R. 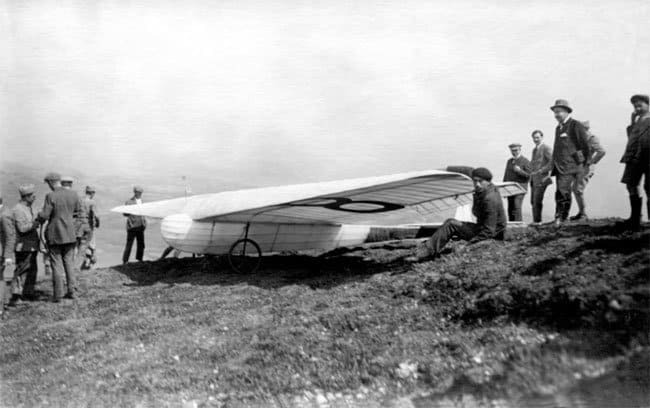 105, France for the first time had two gliders which were spacious enough to accommodate pilots and their parachutes and of a strength at least equal to that of the German gliders. 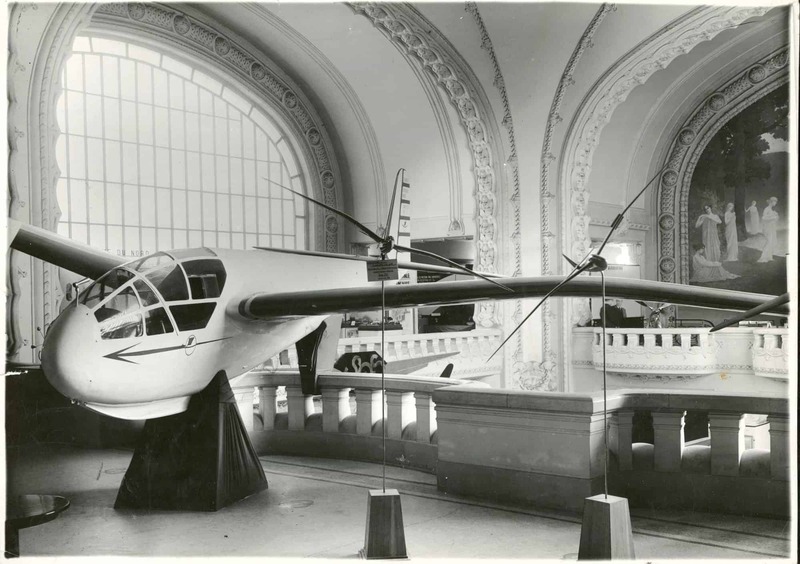 At the end of 1941 at the Casino de Riom these two two remarkable new machines were revealed by Roche Aviation to great approval. In 1942 performance tests commenced on the first prototype, but on the 9th of November 1942, before the tests could be completed, the German forces entered and occupied the ‘Free Zone’ and brought to an end any further development in gliding. In 1943, one G.R. 70 was taken by the Germans along with other French Gliders and were removed from France. They were known to be in German service in 1944, but unfortunately did not survive the war. The second G.R.70 was hidden and was flown again after the war when it was involved in a fatal crash.Despite their excellence, they were not built again. The Glider was full of promise and very strong. 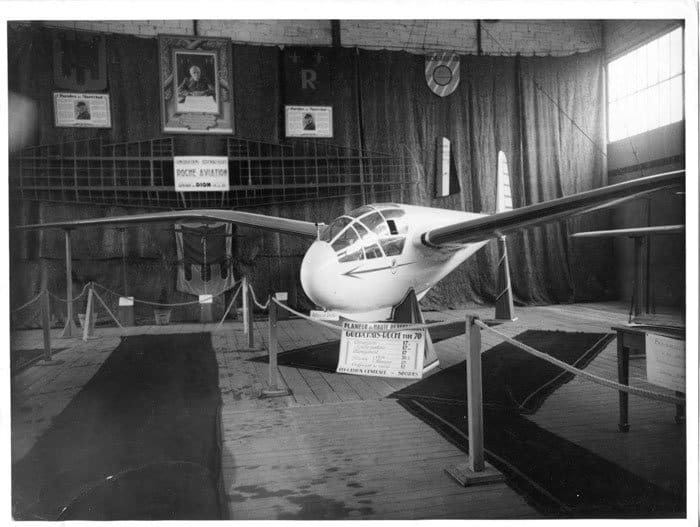 It unfortunately crashed in 1946 due to its cotton fabric coming off one wing. The aircraft went at once into a spin and the pilot was killed through parachuting from the aircraft when too low. The cotton fabric wing covering had become rotten due to over exposure to the sun’s ultra violet rays. 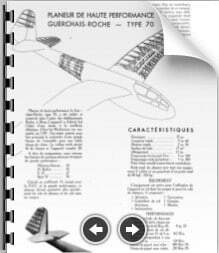 There is one fortnight, we told how the excellent pilot FORTIN had died during a flight on the high performance glider Guerchais-Roche 70. Since then, we could collect much more accurate indications and as respect for the truth and as a lesson of this tragic adventure, we must set the record straight. 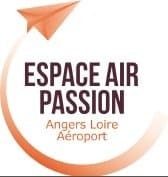 Due to the presence of a turbulence zone between 1000 and 1200 m, Fortin released his tow at 1200m and dropped back down to about 1000 m where he began his test dive to bring the speed to 212 km/h, but at 800m the left wing of the glider began to loose its canvas covering and the glider went into a spin to the left. The pilot ejected the cockpit canopy. He seemed to want to stay on board to save the machine, then it immediately embarked on a spin to the right. Did the pilot finally realised his loss of altitude? Still, he bailed out of the glider only 30 m from the ground without time for the parachute to open and he crashed to the ground. 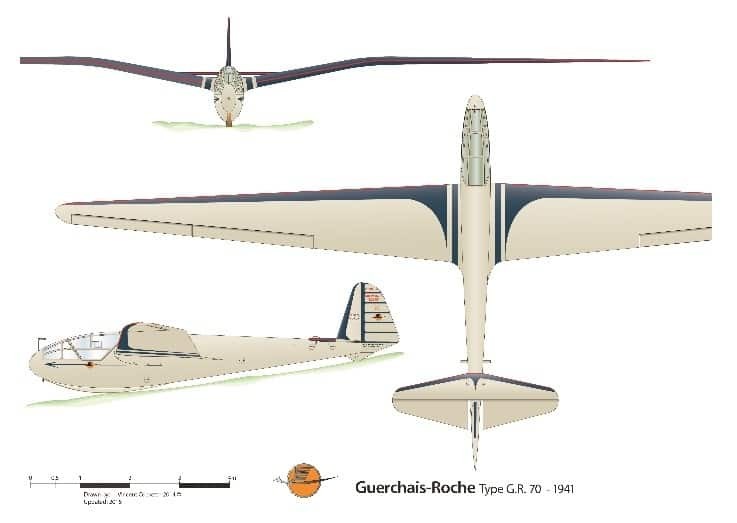 The Guerchais-Roche 70, belonged to Servire des Sports Aériens which had been delivered in 1941 after tests with and without air-brakes. It had performed thirty-three continuos loops and inspired full confidence. The ailerons were not responsible for this story. It is appropriate to fault to the ageing of the covering. The need appears, once again, to worry about ageing and storage and to decide about the painting (probably white) designed to avoid the slow rot of the covering to avoid this most cruelest of surprises. We can only repeat here the expression of our regret for the loss of the young professional pilot Fortin, which is granted for presence in military training, eight enemy aircraft destroyed and had already paid a heavy price by being imprisoned in Buchenwald . This single-seater high performance aerobatic glider had made 26 flights and had started its first formal flight evaluation trials during the war, however the trials were stopped in the second half of 1942 caused by the invasion of “Free Zone” with only partial results having been recorded. Test flights resumed in July 1945, the evaluation starting by additional overspeed tests. In 1942 had only achieved 207 km/h for a requested speed 245 km/h with brakes retracted (140% of the path velocity descending at – 5m/s or 174km/h). A first test of the airbrakes allowed 190 km/h to be reached without residual deformation (A beating aileron, however, was then found by a fast spiral), but the airbrake test ended at 212 km/h in case of damage to the wings. 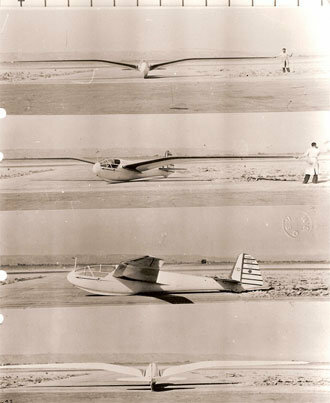 The combined results of the 1942 and 1945 test records nevertheless allowed a sufficiently comprehensive judgment on this glider and showed no major defect. Stalling between 50 and 55 km/h, depending on configuration, followed by a dive was easy to control with a range of speed between 130 and 150 km/h, the minimum speed descent was not exceptional with 0.75 m/s at 66 km/h indicated, but was of the order of 1m/s at 93 km/h that could be of benefit in distance flights. Its handling response in combination with small rudders and low reverse yaw made a nice spiral. The Guerchais Roche type 70 is a single seat cantilever wing glider with an ovoid form fuselage constructed from wood (spruce, plywood, birch and okoume). The Formers are cut from Birch plywood and tracing was combined in such a way that, in a single panel of plywood several pairs can be cut, starting with a larger shape and progressively add two other pairs of smaller dimensions.. These Formers are attached onto four main Spruce stringers smoothly tapering on either side and facilitates the laying of the plywood shell. The rear fuselage fends at a fixed stern post. The front section is entirely glass comprises a portion fixed to the fuselage by the dashboard, and behind that a glazed removable canopy which can be jettisoned in flight. This makes for excellent flight visibility. The cockpit is large enough to allow the pilot plenty of movement, whilst his seat and controls were fully adjustable in flight. The instrument panel has all instruments necessary for navigation and arranged for easy reading. This panel can be removed by the pilot after a forced landing and taken with him.This is because the the cost of flight instruments at the time would have been almost equal to the cost of the glider itself. 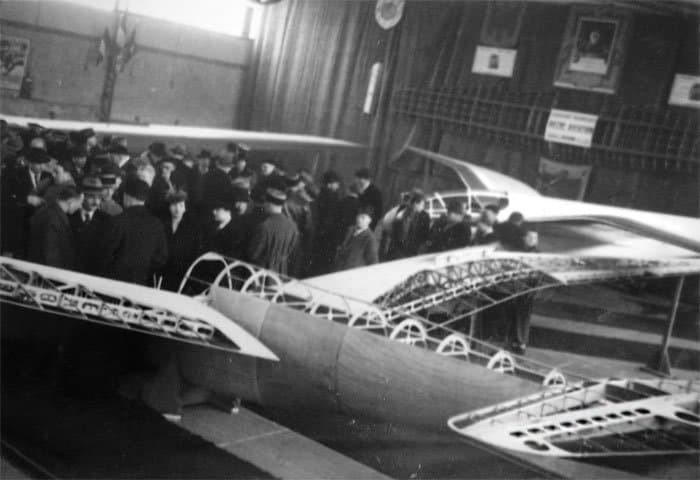 The wings are in two pieces fixed to fuselage by fittings of high strength steel. The wings are gull shaped which allows more ground clearance when landing and gives an angle of inclination when the wing comes in contact with the ground of about 9 to 10 °. Attaching a wing to fuselage is provided by locking cones, eliminating the possibility of any play. The wing includes a single spar calculated to take all the flexing. On this spar are assembled rib noses which form the leading edge. This front section is covered by birch plywood panels. The plywood sheeting provides torsional strength to the wing. The tip of the wing is also covered with an extra plywood reinforcement to protect it when the wing tip hits the ground. On the rear of the wing spar are assembled regular ribs and ribs boxes. All the rear wing open bays are covered in Linen. The ailerons consisting of a spar and a false spar forming torsion box which are in two parts and are built with metal trailing edges. Fitted centrally on the wing are the aerodynamic brakes. They are of the parallelogram articulated type on the top and the bottom and limit the flight dive speed to almost 250 km/hour. The tail comprises a fixed horizontal stabiliser with an elevator; the construction of these are identical to the construction of the wing. Fixing the tailplane to the fuselage is made by 4 bolts and removal can be done without misadjustment of the stabiliser.. The vertical stabiliser is of the same design, comprises a fin from the fuselage construction and attached with a directional rudder which and can be disassembled without any misadjustment to the steering.